You may wonder why a man, born the son of a draper in Bolton Lancashire, would spend a considerable portion of his life writing about Mobberley. Well Stephen Murray was the first child of John Murray, from Bolton, and Elizabeth (nee Brown) from Mobberley. She was the 3x great granddaughter of Joseph Brown who was originally from High Legh. In his mid twenties he embarked upon an eleven year period of cycling from Bolton to Mobberley to gather all sorts of information about the parish. On 24th July, 1901 he married Elizabeth Stewart at Eccles Congregational Church. 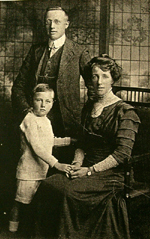 They had a son, John Stewart Murray. Elizabeth died 26/03/1941 and Stephen must have remarried as his manuscript was presented to Altrincham Library by his widow Phyllis. He collaborated with church organist Herbert Hulme during this time and by his mid/late thirties he had gathered sufficient to write his first manuscript (1909), a copy of which was lodged with the Rector of St.Wilfrid’s parish church Mobberley. Over the next 37 years he spent time in Bradford then Somerset with occasional visits back north where he later returned in 1943. He then embarked on an enlarged and more comprehensive second manuscript which drew on some of the work carried out by his friend John Owen. The story of the rediscovery of these manuscripts is reproduced below by kind permission of Terry Mitchell, Mobberley Village Society, and is followed by some notes by David Gilligan, editor of North Cheshire Family Historian Journal. The lure of hidden treasure is one that, universally, seems impossible to resist. Whether in fiction or in fact, whether Pirate Gold, King Solomon’s Mines or the Golden City of Eldorado, –we seem unable to resist the tantalizing tingle of rediscovery. Not all treasures, however, are of the material world - the researching of our history is but an intellectual cloak to this most basic motivation – and to this the Mobberley Village Society has not just succumbed, it has written it into it’s constitution. It’s members are required to seek out any and all facts, and artefacts, relating to the long history of Mobberley and, required to re-instate all treasures found within the public domain. To this end the M.V.S. (in its former incarnation as the Mobberley Preservation Society), produced in 1981, “Mobberley Reflections”, a pictorial record gleaned from old postcards and photographs. Latterly members have been seeking to enhance this record and have been able to create a scanned digital database of over 400 images, which, it is planned, should form the basis of further publications. However the “best laid schemes….”, as Mr. Burns noted, and the MVS is no more immune than any other to that propensity. Their “rooting” for hidden treasure turned up a long lost history of Mobberley and the pictorial publication has been “put on ice”. The chain of discovery would, in fiction, be dismissed as “implausible”. It started with a member at a loose end in Altrincham: he called into the library to enquire if they had “anything on Mobberley”. The “old book” was sent for. It was called “Some Mobberley Records” and was written by Stephen Murray. A note stated that it had been presented in, 1948, by Mr. Murray’s widow, to the Altrincham Library, and that it was one of only two copies produced. The news was hurried back to Mobberley and the Rector contacted – tragedy, the book couldn’t be found. Former Rectors were contacted, even widows of former Rectors. Vague recollections were stirred but no-one knew its whereabouts; it should still be in the church. A further search was instigated and this time the treasure was found: it was nestling on a hidden shelf in the safe……….The rest, as they say, will be history. Permission was given to prepare a print quality copy – no easy task given the format of the original. The MVS was not prepared to give up at that stage and, after a number of false starts, the copy was finally produced. You now own and, hopefully, will enjoy this unique record of historical Mobberley. A work of scholarship motivated by a man’s passion to explore his own ancestry. A work of love created by Stephen Murray by his own research, with his own photographs and set down by his own hand (pen and type). We now dedicate this edition to the memory of Stephen Murray and to all Mobberley Folk, past, present and yet to be. P.S. If you are ever in Altrincham# Library, ask to see Stephem Murray’s personal copy and try to spot the differences. The Mobberley Village Society is indebted to the Reverend Melvin Gray, lately Rector of St. Wilfrid’s Parish Church, Mobberley, for permission to produce these copies, and to Christine Pemberton, for her painstaking work in copying the original. * This was the first manuscript. “Stephen Murray started visiting Mobberley (from Bolton) around 1900 as part of his family history research (his mother ELIZABETH BROWN was born in Mobberley) and he quickly made friends with Herbert Hulme. He says he was a frequent visitor to Mobberley between 1898 and 1911 and this prompted him to collect records and take photographs of houses and scenes in the district10. Murray and Hulme completed a first 'draft' of this collection in 1909 and presented a bound copy of it to the Rector of St Wilfrid's Church. Murray then left the area but continued his research from a distance until he returned (back to Hale near Altrincham) in 1943. He says more records were available by then and he was able to complete the project which he had been working on for over fifty years. The result (which is now in Sale Archives, at the Local Studies Library) is a magnificent and unique manuscript of Mobberley Records which his widow kindly presented to Altrincham Reference Library on 29 January 1955 11. A photograph of the MS appears on the next page. By writing this tribute to these unsung heroes I hope I can keep their memory alive. Long live regional history and long live the antiquarian”. 11. Stephen Murray died 18 July 1954. David also wrote in the same issue# “Family History at Mobberley” and “Visiting Mobberley in 1888”. #For more information see Vol.33 No.2 - May 2006.